Through out the year, and especially during the Month of May – National Lupus Awareness Month, the Sorors of Sigma Upsilon Nu continually commit their efforts to shed light on Lupus as a significant public health issue that requires national attention and action now. Our 2013 Fundraising goal is L$100,000. All are invited to join us in our efforts support our efforts and attend our month long series of major events and ongoing activities. All funds go to Lupus Foundation of America or LupusUK . 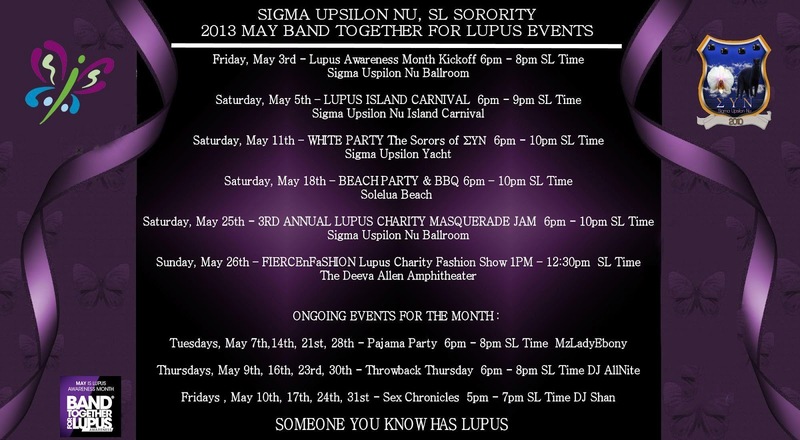 The Lupus Awareness Foundation group was founded to Educate ~ Support ~ Fundraising for the Lupus cause. We appreciate all the wonderful support our fundraising events generate & all monies raised are paid to RL Lupus charities through our giving sites. 1. Direct donations through our site or in-world donation boxes. 2. Sponsorship ~ for owners/designers, donating an item for sale in your shop as a 'Shop For Lupus' with a % or all lindens going to the Lupus Foundation. 3. Sponsorship for DESIGNERS ~ Donating a One-of-A-Kind design to auction during the month of May with proceeds benefiting Lupus Foundation. 3. Placing a donation/Information Kiosk at your site during the month of May. 6. Become a sponsoring business by Donating $L1,000.00 or more for the Month of May. You can donate in one of our donation boxes or @ an event. If you prefer you can donate through our giving site where donations go direct to the Lupus Foundation of America or LupusUK . All sponsors are included on all marketing material, posts, website and blog as well as any advertisement and interviews during the month of May. Sigma Upsilon Nu, SL Sorority was born in the hearts of its founders on April 9, 2010 when dissatisfied with a lack of consistency with standards within their former organization, Cleopatra Kellman (Big Sister Everlast) and Angel McMullen (Big Sister Gemini) set out to create a sorority based on sisterhood and integrity and excellence. Neylaan Kytori (Big Sister Steadfast) and Monique Kessel (Big Sister Go Hard) were brought aboard to complete the founding team. Sigma Upsilon Nu was created to offer women within the SL community a place of sisterhood with attention to standards and integrity. Upon the formation of Sigma Upsilon Nu the founders thought it necessary to activate the role of Mentor. Soror Deeva Allen aka Big Sister Wisdom, served as the first Mentor of Sigma Upsilon Nu. On April 29, 2010, Sigma Upsilon Nu crossed its first official line - Evolution which consisted of Sorors Floetry Catnap aka Big Sister Passion, Former Soror Jennyfer Silverfall aka Big Sister Dazzle, Former Soror Lustfulbarbii Sugarplum aka Big Sister Fuego, Malika Shepherd aka Big Sister Quietstorm, Former Soror Rubee Sugarplum aka Big Sister Heavenly, and Tierra Xue aka Big Sister Sixx. As we continue to grow our goal is to continue to walk proud as a panther, as delicate as an orchid, and to provide strength as we take from the onyx, our sorority jewel. To generate UNITY among all women by fostering a strong sisterhood based on Individuality, Honesty, Loyalty, Respect, Responsibility, and Excellence.